Why Lord Jagannath is known as Daru Devata? The murtis of Jagannath, Balabhadra and Subhadra worshipped in the temple is made from neem tree. Daru means neem tree in local language. Jagannath is known as Daru Devata. The neem tree from which Vishwakarma carved the murtis of the three deities was found floating in the sea. Floating of Daru in the ocean is also mentioned in the Rig Veda. Prayers are chanted for taking shelter in the Daru in the ocean. 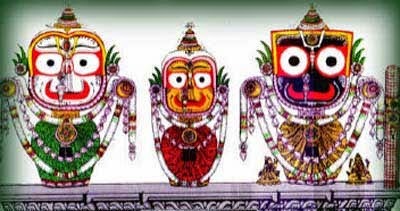 Symbolically meaning the only hope in the ocean of misery is by taking refuge in Jagannath. Jagannath is also referred as Daru Brahma, godhead manifested in a wooden image. Jagannath is also referred as Darudevata and Daru Brahma Purushottam. The concept of Daru Brahma was made popular through the Sarala Mahabharata – the Oriya version of the Mahabharata. The origin of the murti of Jagannath is explained in detail in it.